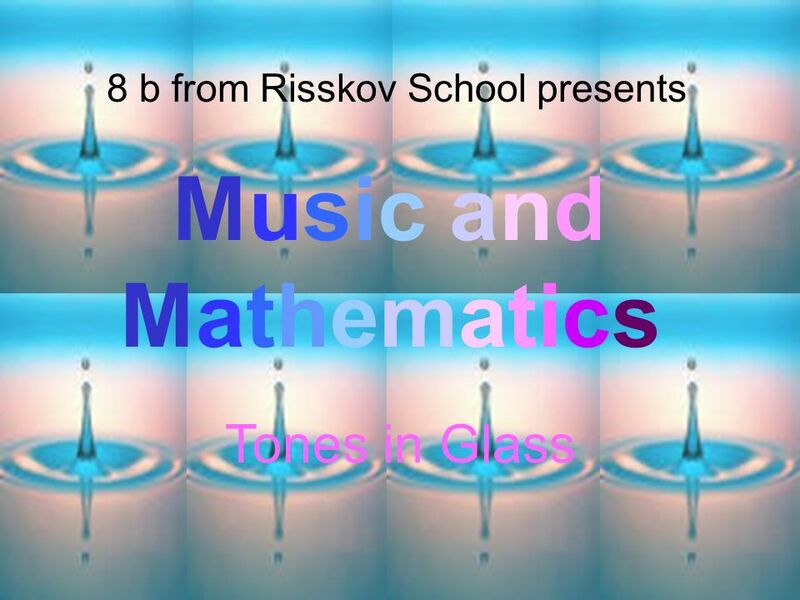 Music andMathematicsMusic andMathematics Tones in Glass 8 b from Risskov School presents. 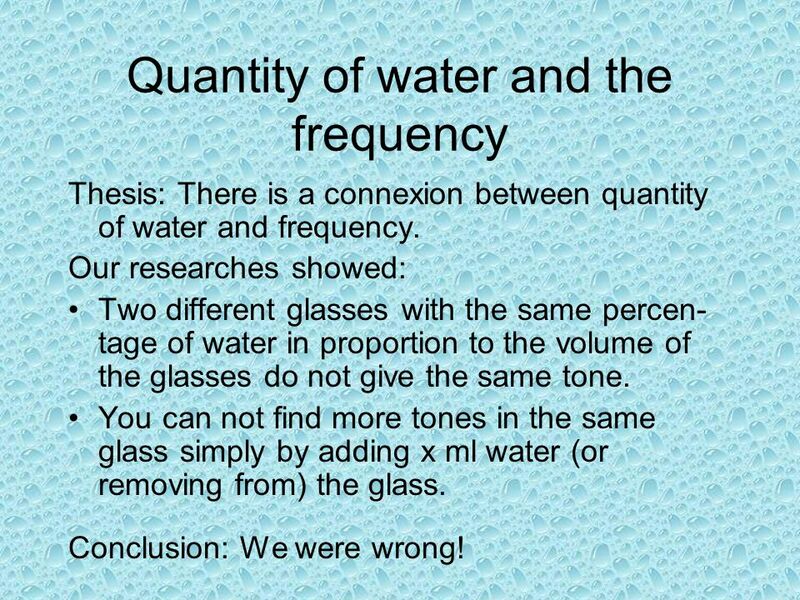 6 Quantity of water and the frequency Thesis: There is a connexion between quantity of water and frequency. Our researches showed: Two different glasses with the same percen- tage of water in proportion to the volume of the glasses do not give the same tone. 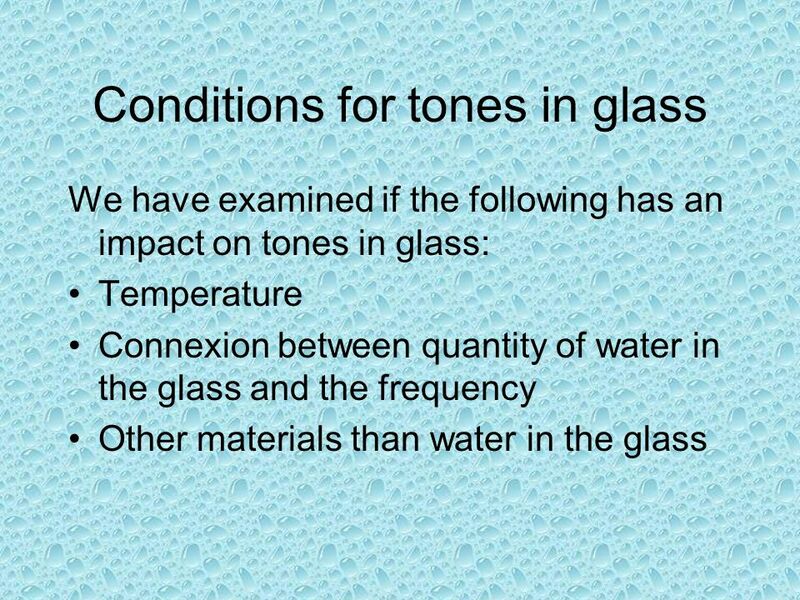 You can not find more tones in the same glass simply by adding x ml water (or removing from) the glass. Conclusion: We were wrong! 10 Other materials than water continued Conclusion: The numbers do show a difference in the tone. You could not hear a difference in the tone. 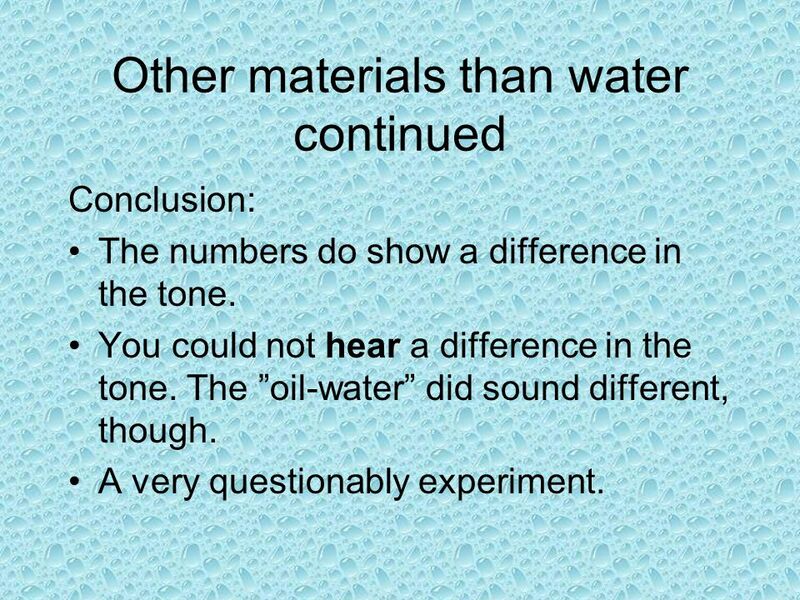 The ”oil-water” did sound different, though. A very questionably experiment. 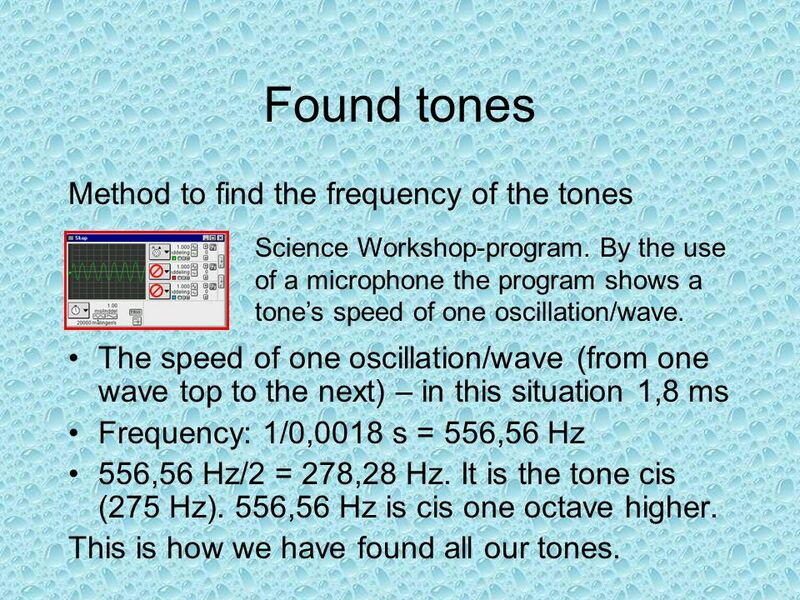 11 Found tones Method to find the frequency of the tones The speed of one oscillation/wave (from one wave top to the next) – in this situation 1,8 ms Frequency: 1/0,0018 s = 556,56 Hz 556,56 Hz/2 = 278,28 Hz. It is the tone cis (275 Hz). 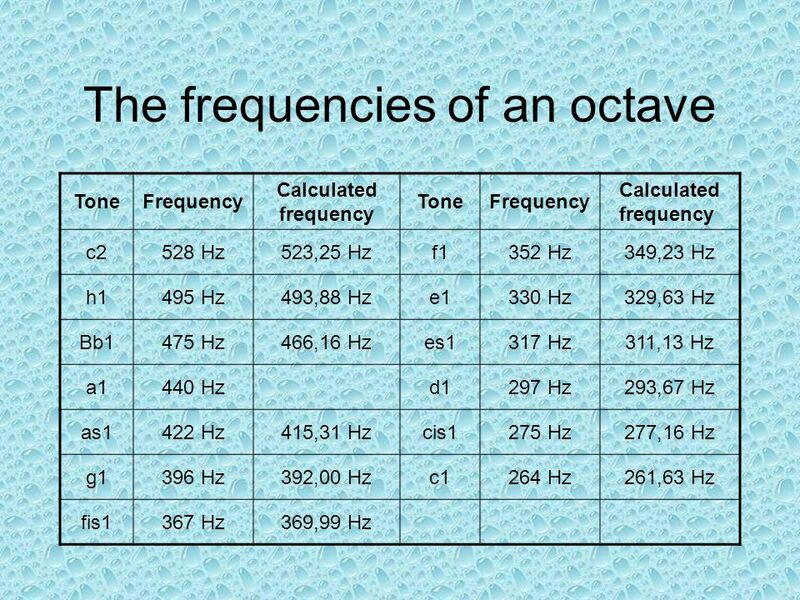 556,56 Hz is cis one octave higher. This is how we have found all our tones. Science Workshop-program. By the use of a microphone the program shows a tone’s speed of one oscillation/wave. 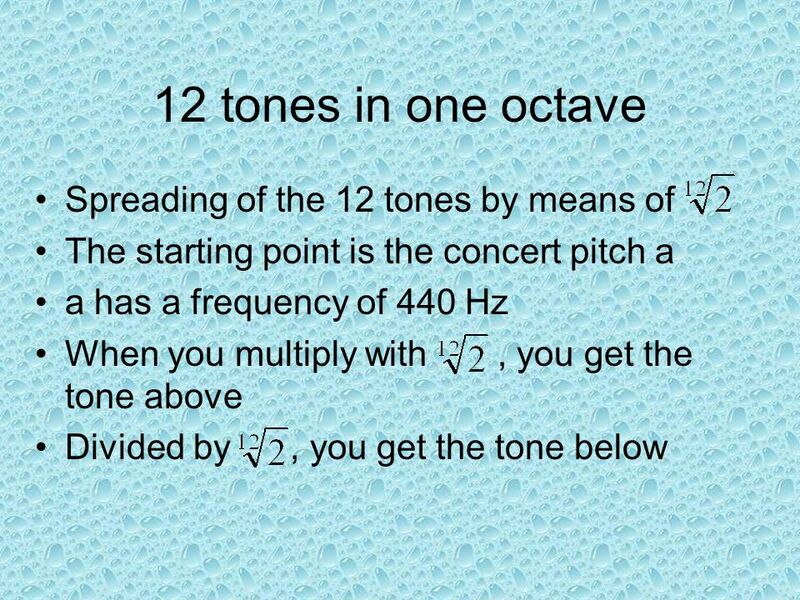 14 Conclusion You can spread the 12 tones in one octave by means of. 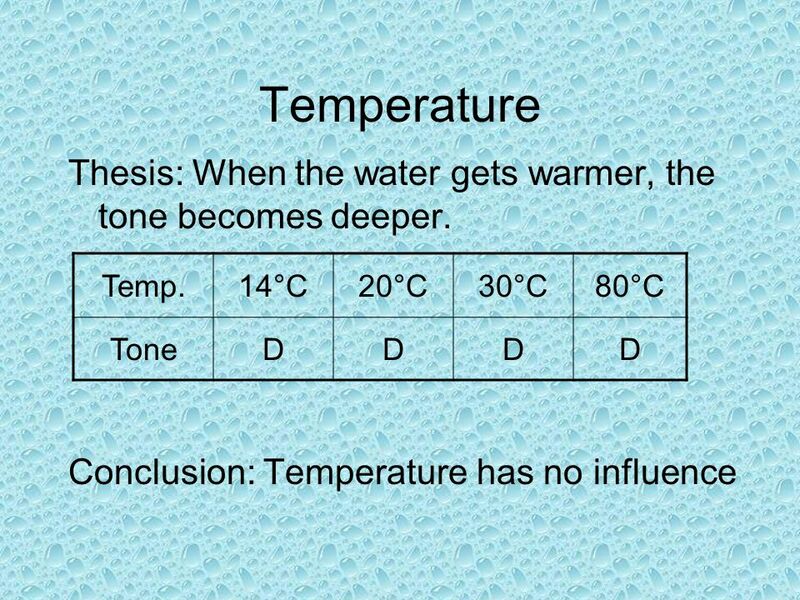 Temperature of water in the glass has no influence on the tone. 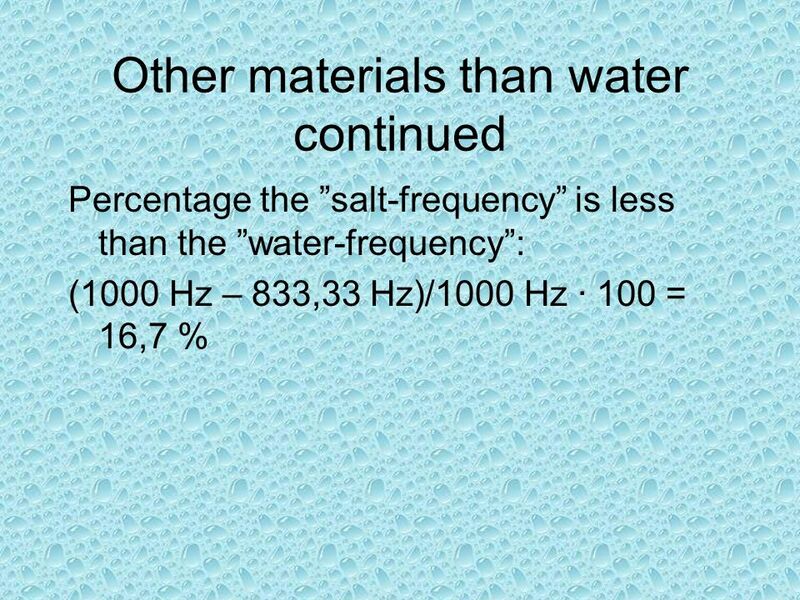 There is no connexion between quantity of water and frequency. 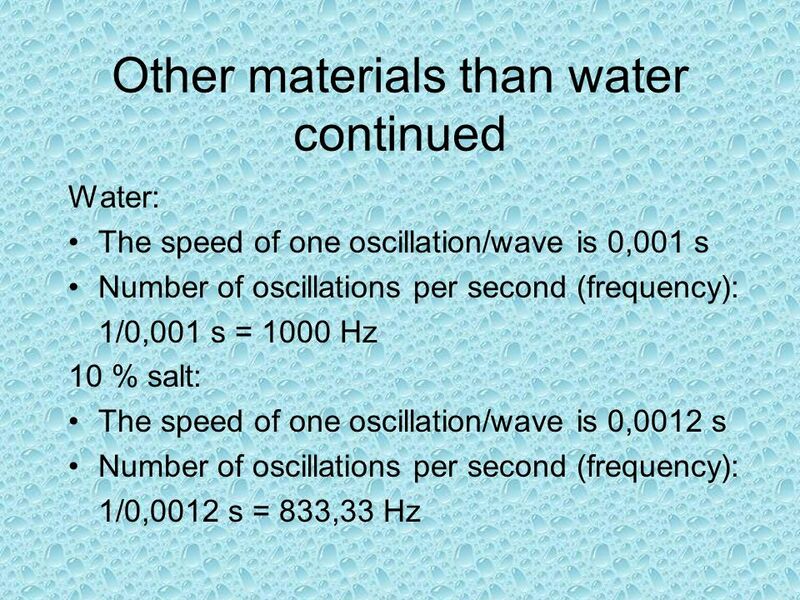 Mathematical there was a difference in the frequencies, when the material is different from water. But you could not hear it (a very questionably experiment). 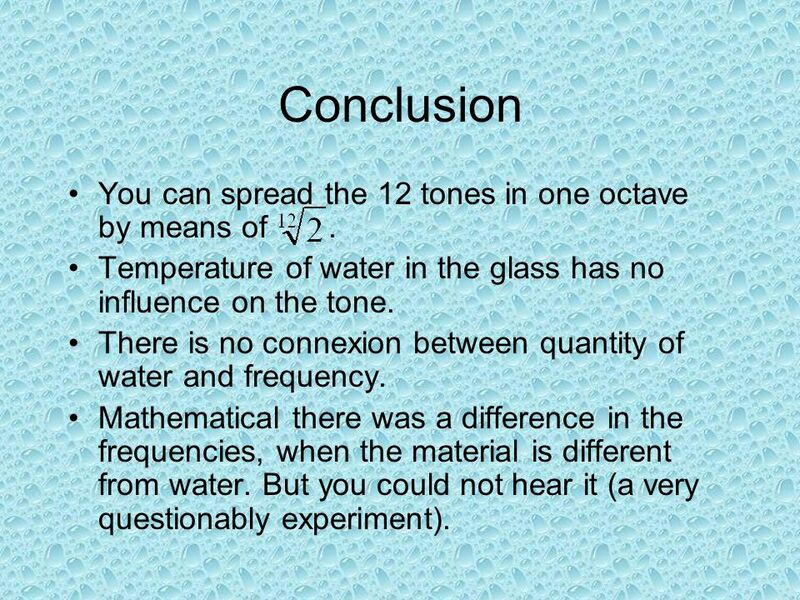 15 Conclusion continued We found our own method to find the frequencies of the tones by the use of Science Workshop. Our starting point was one oscillation’s speed. 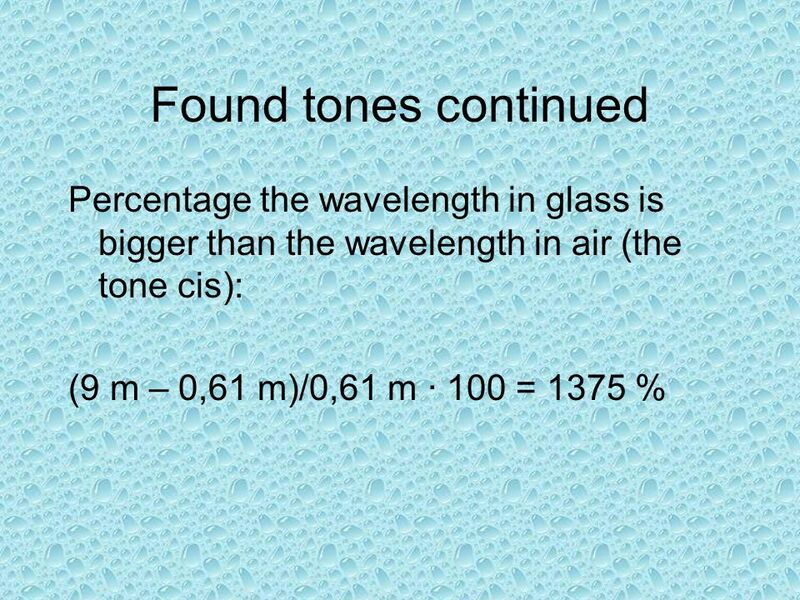 The tone cis’ wavelength in glass is 1375% bigger than the wavelength in air. We think it is a fine instrument, and you can be very good at playing it. In Denmark we have professionals. 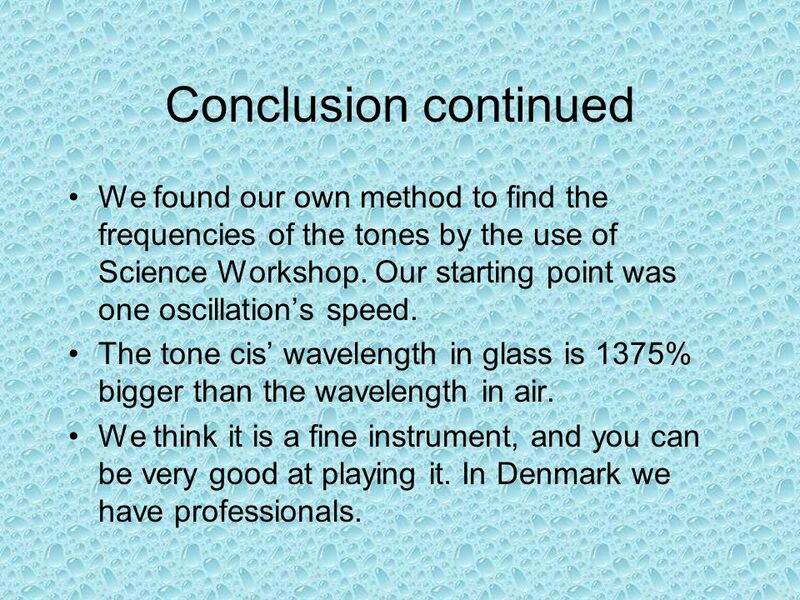 Download ppt "Music andMathematicsMusic andMathematics Tones in Glass 8 b from Risskov School presents." In Example 18.1, we discovered that a listener at point P would hear a minimum in the sound when the oscillator driving both speakers was at a frequency. Chp 13 Sound and Music. FOCUS 2 - FEATURES OF THE WAVE MODEL CAN BE USED TO ACCOUNT FOR THE PROPERTIES OF SOUND 8.2 The World Communicates. Waves and Sound Honors Physics. What is a wave A WAVE is a vibration or disturbance in space. A MEDIUM is the substance that all SOUND WAVES travel through. 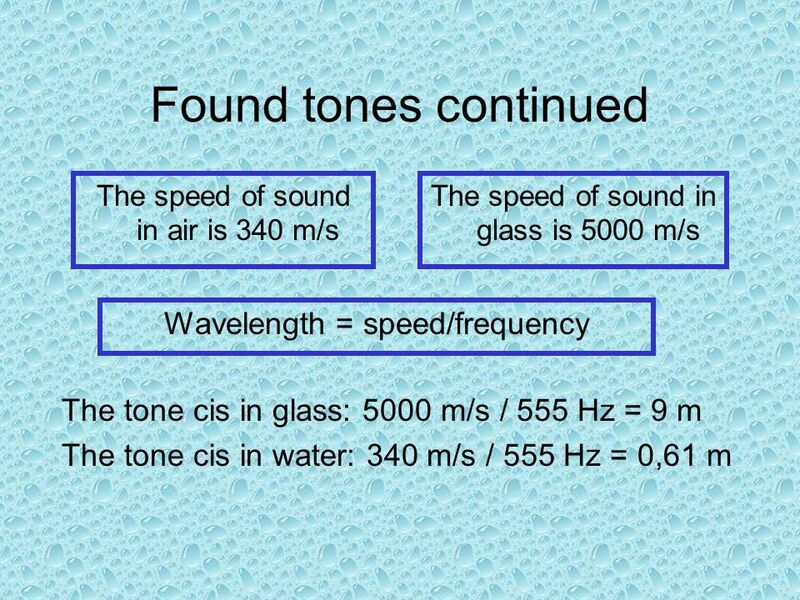 Properties of sound Sound is a longitudinal wave Longitudinal waves travel at different speeds depending on the medium 25 o C 346m/s, water 1490. Sound. Sound Waves  Sound waves are longitudinal waves.  The source of a sound wave is a vibrating object.  Only certain wavelengths of longitudinal. Find the fundamental frequency and third harmonic of an organ pipe of length 50cm. Assume the organ pipe is closed at one end and the speed of sound in. Sound. 1. The ____ of a sound is how high or low we hear its frequency. pitch. 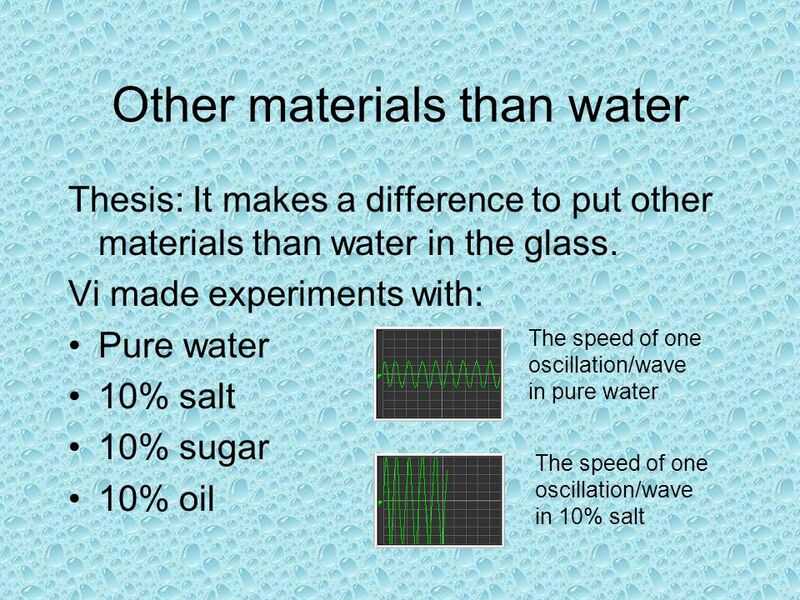 Sound How does the amount of water in a glass affect the pitch of sound? 30 mL 45 mL 60 mL 75 mL 90 mL 105 mL 120 mL 135 mL arbitrary volume d r m f s.
Vibration of different volume of water will produce different pitch. Longitudinal Standing Waves  Consider a tube with both ends opened  If we produce a sound of frequency f 1 at one end, the air molecules at that end. 30 Week Assessment Review Guider. 2. When the frequency of wave increases, what happens to the wavelength? Sound Sound is a wave that carries vibrations. It is mechanical, longitudinal, and a pressure wave. Waves and Sound AP Physics 1. What is a wave A WAVE is a vibration or disturbance in space. A MEDIUM is the substance that all SOUND WAVES travel through. 1. A Pan pipe is 62.2 cm long, and has a wave speed of 321 m/s. It is a one end open, one end fixed pipe. a. Draw the first three harmonics of vibration. Physics Book Chapters 16 and 17 Conceptual Book Chapters 25 and 26 Unit 9 - Waves and Sound.